From 08 to 20 April 2018, Leeuwarden Airbase again hosted one of the largest international fighter pilot exercises: Exercise Frisian Flag 2018. For two weeks more than 70 fighter aircraft from various countries were exercising the execution of offensive and defensive missions, with the support of Airborne Warning and Control System, Electronic Warfare airplane, and Air to Air refueling tankers. Air Refueling (AAR) was recognised in 2012 as a capability shortfall in Europe. To address this, the European Defence Agency has developed a European AR initiative looking at the three following objectives: increase the overall AAR capacity, reduce fragmentation of the fleet, and optimise the use of assets. Within the framework of the EDA’s initiative, the European Air Transport Command took the lead regarding AAR training and together with Eindhoven airbase and the MCCE, conducted the first EART in 2014. The overall objective of EART18 is to address the lack of interoperability amongst EU tanker crews and increase AAR planning and tasking knowledge in a multinational environment by organizing a dedicated AAR exercise in support of the Ex Frisian Flag 2018 fighter exercise. EART is a great example of close coordination in the AAR domain between European Air Transport Command (EATC), European Defence Agency (EDA), Eindhoven Airbase, Movement Coordination Centre Europe (MCCE) and 334 KDC-10 Squadron by training together in a effective multinational environment with increased effectiveness and interoperability. EART18 delivered AAR training over a two-week period, offering participants a unique opportunity to plan and execute missions within a multinational framework. EART was developed on an increasing complexity basis, starting from single ship missions and evolving to being part of COMAO missions within Ex Frisian Flag 2018. During EART18 the following 4 tankers will support Ex Frisian Flag: a Dutch KDC-10, a French C-135FR, a German A-310 and an US KC-135. Due to national requirements the the French C-135FR, Italian KC-767 and US KC-135 were withdrawn from the exercise. Like in 2015. 2016 and 2017, MCCE AAR Cell is supporting EART18 with providing an AAR Supervisor to Frisian Flag responsible for all AAR tasking during the exercise to be supported by tankers located at Eindhoven Airbase to maximize the use of the different EART Tankers within the scenarios performed. 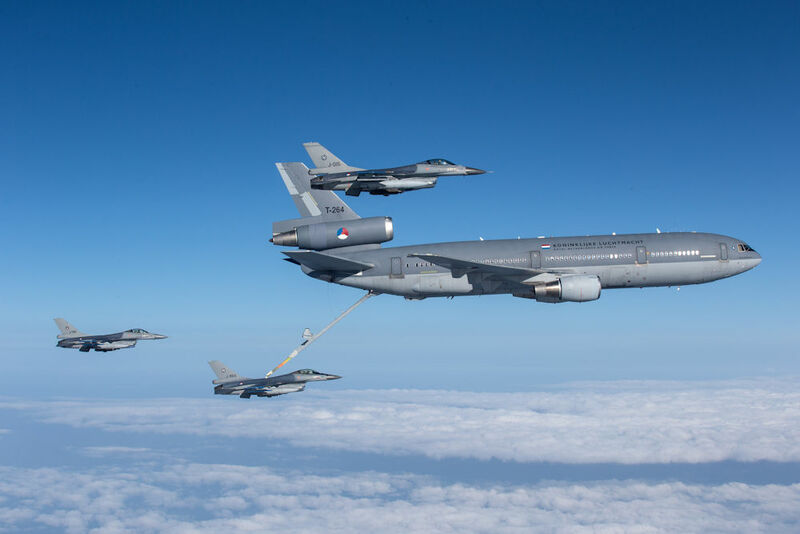 The AAR Supervisor has also given “hands on” training to 3 graduates of the NATO Specialized Heavy Air Refuelling Course (SHARC) within the AAR Cell at Frisian Flag, which can be considered as a logical post SHARC action as it reduces skill fade and prepares graduates for “real world” operations. Captain Wesley Ekwall promotion to the rank of Major.